When you go to the store to purchase floss are you overwhelmed by the sheer number of choices you have? It is no longer just waxed or unwaxed; there are different flavors, styles, and promises on each flashy package, making it very difficult to make a decision. Luckily, the success of the floss you purchase is more in the technique that you use rather than the type that you buy. Of course, if you have special circumstances, such as teeth with very little gaps or braces, you will need to purchase a particular type of floss to ensure that you do a good job, but other than that, the fact that you floss every day, at least once, and are getting in between each tooth is the key factor in preventing oral health issues including tooth decay and gum disease. • Waxed - This type of floss is only nylon floss. On top of the nylon is a wax that helps the floss glide through your teeth a little easier. This might or might not be necessary and is really up to your personal preference. If you have tight spaces between your teeth or have braces, the waxed floss might move a little easier through the areas. Some people just prefer this texture as well - it makes them feel as if they are doing a better job flossing. • Unwaxed - This type of floss can come in a variety of different materials including nylon or filament. Because it is not waxed, it will not glide as smoothly, which some patients prefer because they are then paying ample attention to how they are flossing. If extra effort has to be used to get the floss to the appropriate area, you might pay better attention to the act of flossing and putting up a fight against gum disease. • Nylon - This type of floss is the most common. It is the one that you likely flossed with as a kid and see on all of the commercials. It has come a long way in recent years in terms of thickness and flavors, but it is still the same floss you remember. • Monofilament - If you have ever had a piece of nylon floss rip while in between your teeth, you may appreciate the benefits of monofilament. This material is much stronger than nylon so it very really rips. It is a bit thicker, however, which can be difficult if you have any type of appliance in your mouth or teeth that are rather tightly aligned. The main factor here is that you are flossing. We do not push a certain type of floss on patients; we just want to know that you are flossing because it is the number one way to prevent gum disease and even the subsequent risk of heart attack or stroke. 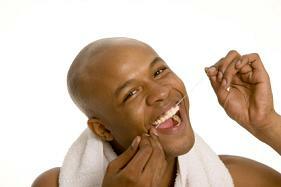 Do not skip flossing your teeth at least once a day or more often if you have food stuck in between your teeth. That food debris will just sit in your mouth, putting you at risk for serious oral health issues as a result. Please contact us if you have any questions about your dental floss.